Last year, Disney released two Oscar-nominated animated films: Zootopia and Moana. Choosing a favorite between the two was no easy decision. Both had gorgeous animation and both and beautiful stories to tell. The former had themes of inclusion and welcoming diversity, while the latter focused on a spirited young girl who strived for independence but also wanted to pay respect to her family’s history and culture. In the end, Zootopia came out the winner, but you can make an argument for Moana being the better film. Now you’ll be able to make a comparison with Moana hitting Blu-ray shelves this week. The film, of course, comes chalk full of bonus feature goodies which include deleted scenes, an animated short, and the Polynesian culture that helped inspire the film in more ways than one. Check out the full review below. Disney re-releasing current films as sing-alongs are quickly becoming a staple. Because it was such a hit with Frozen a few years back, the studio decided to bring it back again, this time for their current hit film Moana. Find out more about it below. Last weekend, many turned to the movie theaters to get away from families or crazed shoppers. While there was a lot to offer, Moana ended up being the number one film of the weekend, taking in $82 million in its debut. If you haven’t seen it yet, well then you’re missing out on one of the greatest Disney movies ever (check out our review here). And to prove it, Disney has released a full music sequence from the film that sees Dwayne Johnson singing his song “You’re Welcome.” Check it out below. Dwyane Johnson stars as Maui, a boisterous demi-god who is a trickster and can morph into any animal he chooses, in Disney’s latest animated feature Moana. 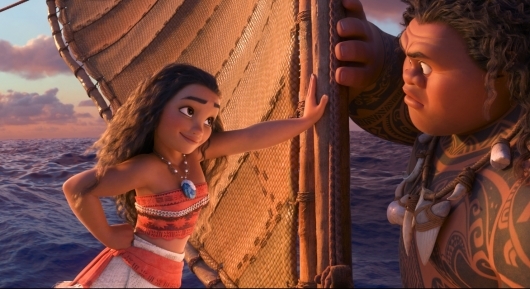 While the character can let some of his godly acts and heroism feed his ego, it is Moana (voice of Auli’i Cravalho), the 16-year-old daughter of a chief, who teaches him a lesson in modesty and helps him find his lost identity as she searches for her own. Together, they voyage across the ocean to return the Heart of Tefiti to its rightful place in hopes that it will restore all life to what it once was. We were recently invited to sit down with fellow journalists at the press conference for the film, where Johnson and Cravalho talked about bringing the spirit of Aloha to Moana and what it meant for them to share their Polynesian culture with the world. Check out what they had to say below. These are trying times. With an unknown future ahead of us, there is no doubt in my mind that we will need more movies like Moana. Not in terms of just needing more animated features, even though I really do love those, but in terms of delivering a powerful message of searching for identity, female empowerment, never forgetting where you come from, and remembering that not only do princesses come in just more than one color and they too can do a man’s job as well. Moana reminds us just how far Disney Animation has come, and with a great voice cast and some catchy tunes, it will be a film that is recognized for more than just its animation, but also for celebrating and honoring a culture. Just don’t forget to bring idiotic chicken along with you, because they are good for more than just a few laughs. My full review below. Back in September, we shared what we learned from watching an early preview of Walt Disney Animation Studios’ Moana. John Musker and Ron Clements return to collaborate for their seventh film together, and their first CGI film which follows the title character as she goes on a journey of self-discovery and saving her people. A five-year long process in development, the movie will be released in theaters in just a few short weeks, and now we can give you our final piece from that presentation that we were invited to (along with our fellow journalists) back in August. In this exclusive one-on-one interview, we talk to Moana writers Jared Bush and Dave Pimentel about collaborating with the Oceanic Story Trust to develop the story, finding out what a movie wants to say, avoiding being too preachy, the 12 screening process, and much more. Check out the full interview below. 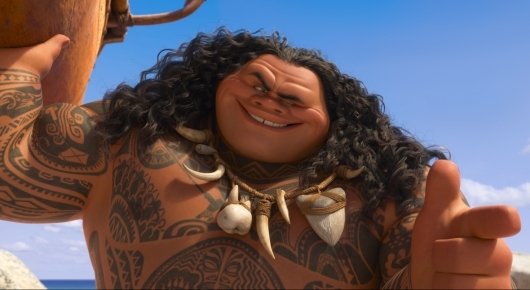 Based on our coverage of Moana, we know that Maui (voiced by Dwayne Johnson) is a rather arrogant demi-god who needs a lesson in humility. Enter Moana (voiced by Auli’i Cravalho), a natural born navigator who is on a quest to save her native home island of Motonui. It will be very interesting to see how a young teenager will put up with someone who is as obnoxious and confident as Maui, and we start to see just a little bit of the chemistry between the two in two new clips from the film. One which will showcase Johnson’s talents as a singer, and the other when the two meet each other for the first time. Check it out below. Disney has released a new trailer for their latest oceanic voyaging adventure Moana. 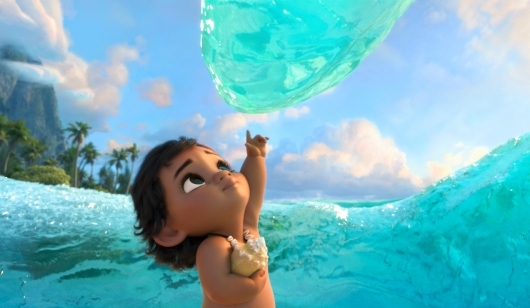 The movie stars Dwayne “The Rock” Johnson as Maui, “the demigod of the wind and sea, and hero of men,” and introducing Auli’i Cravalho, who will voice the title character who sets out on a daring voyage to save her people. Check out the new trailer below. This November, Walt Disney Animation Studio will be releasing their second theatrical feature of the year and their 56th overall, Moana. 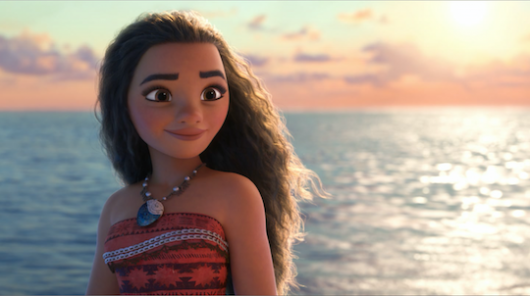 Longtime Disney collaborators John Musker and Ron Clements return to direct this film about a teenage Polynesian princess who ventures out on a journey to save her people and to find her identity. The film brings in all sorts of talent that we’ve pretty much come to expect from the studio, from the voice talents of Auli‘i Cravalho, Dwayne Johnson, Jemaine Clement, Rachel House, Temuera Morrison, Alan Tudyk, and Nicole Scherzinger, right down to the music from Opetaia Foa’i, Mark Mancina, and Lin-Manuel Miranda. In August, Disney invited us (along with a group of fellow journalists) to watch a couple of scenes and learn about the process of developing a script, creating the film’s setting, polishing the effects, and creating the two lead characters: Moana and Maui. Just like Zootopia, it has become apparent that the studio emphasizes the importance of research for their stories and pushing the envelope in animation. Check out what we learned from the scenes and the presentation below.